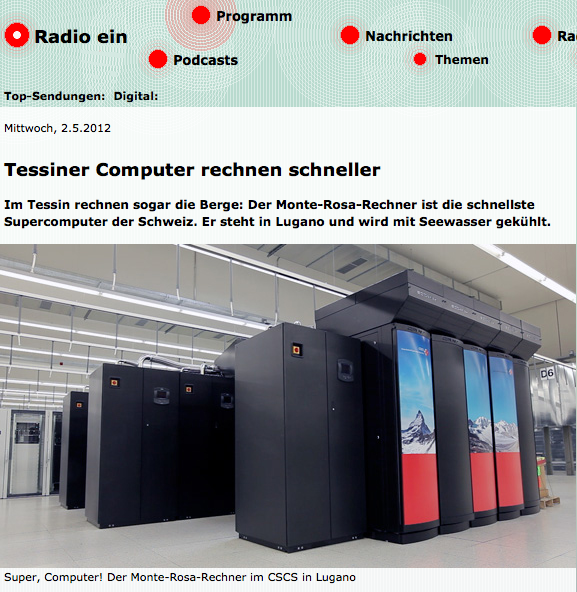 The Swiss radio broadcast reported (in German) about CSCS, Supercomputing and the move to the new building in Lugano. DRS3 visited CSCS at the end of April, just after the move of the supercomputer Monte Rosa to the new location in Lugano and interviewed the General Manager, Dominik Ulmer and Maria Grazia Giuffreda, Head of User Support. Dominik and Maria Grazia explain in the interview the particularities of the new building and the applications and relevance of supercomputing.